Gold in 2011 – Is It Too Late to Buy Gold Now? We’re seeing lots of interest from newcomers to the metals markets currently, mostly wondering if they are already too late to buy Gold (or Silver) and as this article is as relevant now as when it was first published 6 months ago (and correct, getting more correct every day) we thought it should get some more exposure. The connotation of “foothills” is a perfect way of stating precisely where we are at in the collapse of the US Dollar based global financial system and the return of the king, gold as money. It is perfect because while we are certainly seeing a movement towards a mania, with gold hitting fresh all-time highs in US Dollar terms on almost a daily basis we are still far from reaching the top of the mountain. We have begun a) to enter into the mania stage but b) we are still a long away from reaching its peak. Here are arguments and proof for both statements. We borrowed the following illustration (below) from Dr. John Paul Rodrigue of Hofstra University because we thought it gave an excellent depiction of the progression of most manias. It should be pointed out, however, that we don’t necessarily see gold as being in a “typical bull market”. What we believe we are witnessing is the return to gold as money after decades of suppression. However, we believe that the mania phase of this progression will transpire. The part of this graph that does not make sense in terms of gold is the part after the “New Paradigm” is reached. It is our belief that once we reach the new paradigm, it actually will be the new paradigm. There will not be any denial nor “return to normal” because returning gold to functioning as money is in itself a return to normal. That is not to say that certainly gold will likely overshoot, by a great amount, its “true” value at the height of the collapse of the US Dollar based global financial system in terms of its value in comparison to other goods. And there will be a time when it will make sense to sell some or all of your gold in favor of other assets. 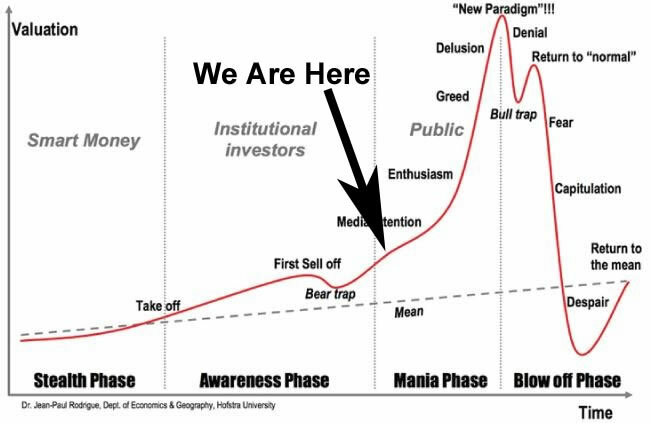 But for our purposes lets use this chart to try to approximate where we currently are in the mania stage of gold. In our opinion the “Stealth phase” was the phase between 2001-2004 when absolutely no one but a few, such as The Dollar Vigilante’s all-star Senior Analyst, Ed Bugos, were pounding the tables to buy gold and gold stocks – but no one listened. For those that have been invested in this sector since 2004, you will recognize the period from 2004-2009 as being the awareness phase. Many junior precious metals stocks, such as Osisko Mining (T.OSK) and literally hundreds of others were all of a sudden going from $0.25 to $5 and doing massive $50 million+ financings with savvy institutional investors. And, for those of you who lived through the brutal sell-off of 2008, you will recognize that as being the “first sell off / bear trap” on the chart below. And that brings us to August of 2010, which began the very first baby-steps into the mania phase. You can see all the signs of it around us now. Gold is mentioned more and more in the media and it has begun to start making all-time highs on a regular basis. The dumb money, governments and central banks, are finally starting to catch on to what is happening. The central bank of Bangladesh bought 10 metric tonnes of gold from the IMF last year, this is on top of 212 tons of gold the IMF sold the previous year to the Reserve Bank of India, the Bank of Mauritius, and the central bank of Sri Lanka. And Saudi Arabia, Russia and the Philippines have recently announced big additions to their gold reserves. Even Jim Cramer now likes gold. If that isn’t proof we have begun the mania phase we don’t know what is. But how can we be sure that we aren’t very close to the peak in the precious metals market? Nothing is certain in life but there are numerous indications that we are still early on in the mania phase. First, Nick Laird who runs the superb gold-data website, Sharelynx.com, and is a subscriber to The Dollar Vigilante, gave us permission to use a chart he put together comparing gold & silver at its current levels to 50 historical bubbles. As you can see, if we are near the top then this was one of the most disappointing bull markets in bubble history! In fact, just to match the gold & silver bull market of the early 1980s gold would have to quadruple in price from here to $5,200 per ounce. And we think this bull market will be much stronger than the 1980 bull market. What Will “The End” of the Bull Market Look Like? That is what the end of a mania looks like. Now, take a look at this headline from the Calgary Herald on September 14th. “Calgarians Rush to SELL Gold After Record High Hit”. They were lining up to sell gold! Nothing could make us feel more content in our position on gold than headlines such as this. When we start seeing headlines that Calgarians are lining up to buy gold, then we may start to look around for an exit. But it’s obvious we are a long way from that. There are almost daily stories now from around the world of small movements towards using gold & silver once again as money. In Mayalysia, gold Dinar and silver Dirham coins were introduced last August by an opposition Islamic political party. Umar Ibrahim Vadillo, an officer with Kelantan Golden Trade, revealed that the first batch of gold and silver coins worth two million Ringgit (US$625k) were sold out in less than a month. The response apparently has been enormous in Malaysia. In Kelantan, businesses from garage owners and taxi drivers are using the gold and silver coins. Even civil servants in Kelantan are paid up to 25% of their salary in Dinars and Dirhams, if desired. As well, in neighboring Indonesia, we featured a video in a blog posting entitled, “Indonesians Get It” where it shows that slowly gold Dinar and silver Dirham are returning to circulation in that large muslim country. Even in Michigan this news story, “Competing Currency Being Accepted Across Mid-Michigan” shows gold, silver and even copper have begun to slowly be used as money. Sadly, Americans have been so repressed, even having private gold ownership outlawed for a good portion of the 20th century that they are much slower than the Malaysians, Indonesians, Chinese and others to even realize what is “real money” anymore. Subscribe to The Dollar Vigilante to keep abreast of all aspects of the ongoing US dollar financial system collapse and how to protect and grow your assets during this time of great turmoil.